One of the (many) fun parts of dancing for fun, and then blogging about it, is that you get to meet some pretty cool and inspiring people. Other ballet students, teachers - and professional dancers. Most of the time, we get to see performing artists only on stage... But what we see on stage, is merely the glittering tip of a dancer's life: the culmination of years and years of hard work, talent, and more work. What is it that drives a dancer to dedicate their life to dance, and what happens before and after the stage lights go on, and off again? 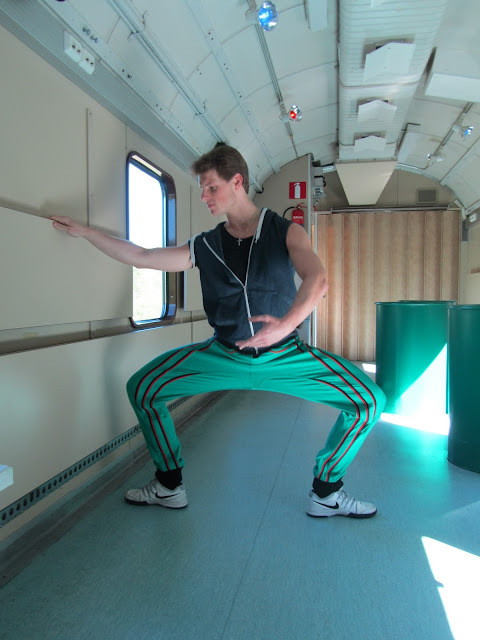 I first met Michal Krčmář on the Finnish National "Balletrain", June 2015, en route from Helsinki to Oulu. At the time, he was just short of turning twenty-five, already a Principal Dancer nominated as étoile. What struck me that he seemed just a regular guy, with a very amiable manner. He introduced himself (of course I already knew who he was), and we had a short but nice chat. I don't always make such an easy connection with professional dancers... Sometimes, they can be reserved or shy, or don't know what to make of a middle-aged ballet blogger. Sometimes, it's me who gets shy (more often than not). With Michal, there was no ice to be broken. Dancers can do barre anywhere, even on the train. Photo by me. The first time I saw Michal Krčmář on stage was in La Bayadère. 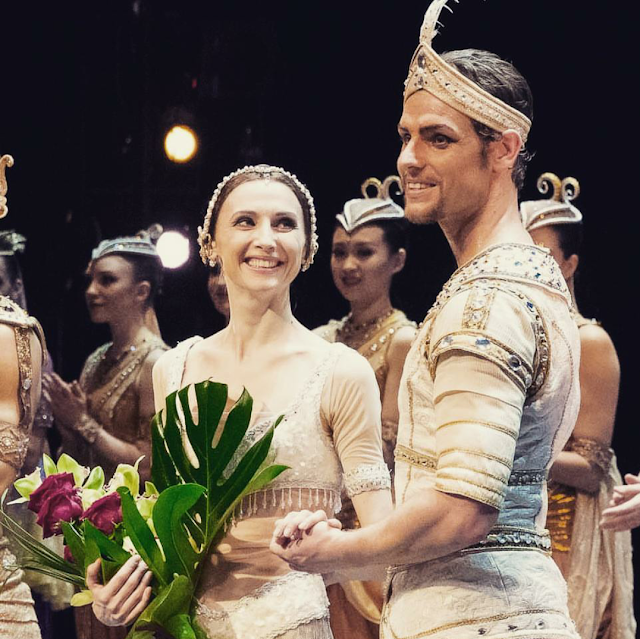 It was the retirement performance of Finnish prima ballerina Minna Tervamäki, and Michal was dancing the role of Solor to Tervamäki's Nikiya. I remember reading an amused comment from Tervamäki, regarding their age difference of twenty odd years… But, on stage, you couldn't tell. What I saw was artistry, experience and youthful exuberance. The outgoing generation meeting the next generation, at that junction were both are already/still in their prime. The standing ovations that followed were primarily for Tervamäki, of course, but it was clear that Krčmář was going places. Since that performance, I've seen him dance Basilio, the Beast (Beauty and the Beast), various princes, abstract ballets, contemporary works, even Onegin - which is a hefty role usually reserved for much older dancers. The last time we met (well, before this interview) was in June, at the Kuopio Dance Festival. I had signed up for a few courses, and Michal was there to perform at the Gala. We chatted over coffee, about dance, life and summer plans. 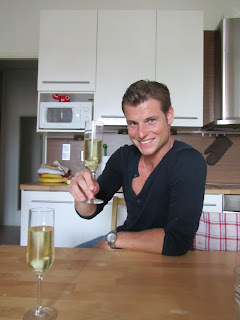 A few weeks ago, we caught up - this time over a glass of champagne. Gotta love that Czech hospitality! The new season at Finnish National Ballet was already in full swing, but I wanted to know how he spent his two-month summer break. It may sound like a luxurious vacation, but no professional dancer can afford to get too relaxed over such a long period. Some time off is, of course, neccessary: to let the body rest and recover, to heal possible lingering injuries, to clear the head, and enjoy life outside of work and ballet. I've known dancers who take complete breaks, and ease back into exercise and class only weeks before the season starts. Everyone has their own style and method. Ball-et. Michal likes to keep active: he plays soccer, ice-hockey, volleyball, does cross-country skiing, snow-boarding, swimming, cycling, break dancing (but no social dancing). 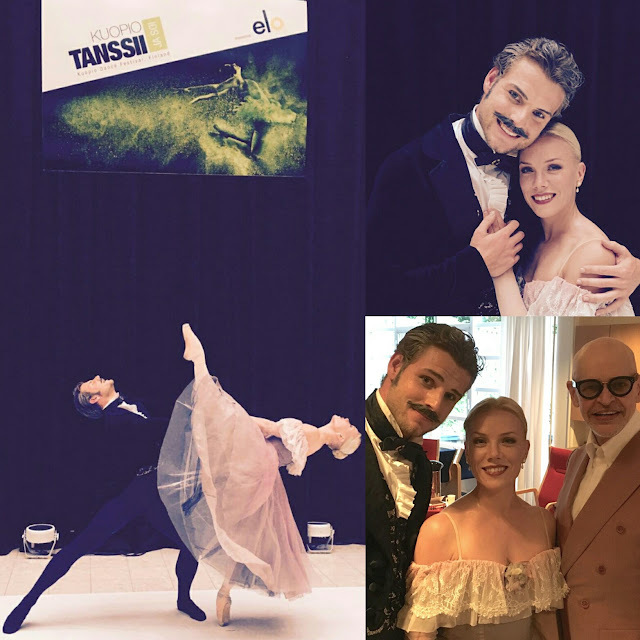 With Salla Eerola, dancing an excerpt from Onegin, at the Kuopio Dance Festival (June 2016). Lower right corner: Michal with Salla, and Jorma Uotinen, Artistic Director of Kuopio Dance Festival. But Michal also made a point about not pushing yourself in the summer: there is no need to become better, it's enough to maintain form and to focus on just a few things. When I asked about classes, he told me that he used his balcony for barre - which is not that different from the chair I used during my summer break... PRO TIP: Yannick Boquin's master class on DVD. When he was a student at the ballet school, Michal did not posses the natural flexibility that allows for easy splits, and he had to put in a lot of hard work to improve. These days, he's one of the more flexible men in the company, and his grand jetés have reached full-split status long ago. But being a Principal Dancer doesn't mean you get to rest on your laurels. For any dancer, to progress and grow as an artist, means to be smart about your dancing. 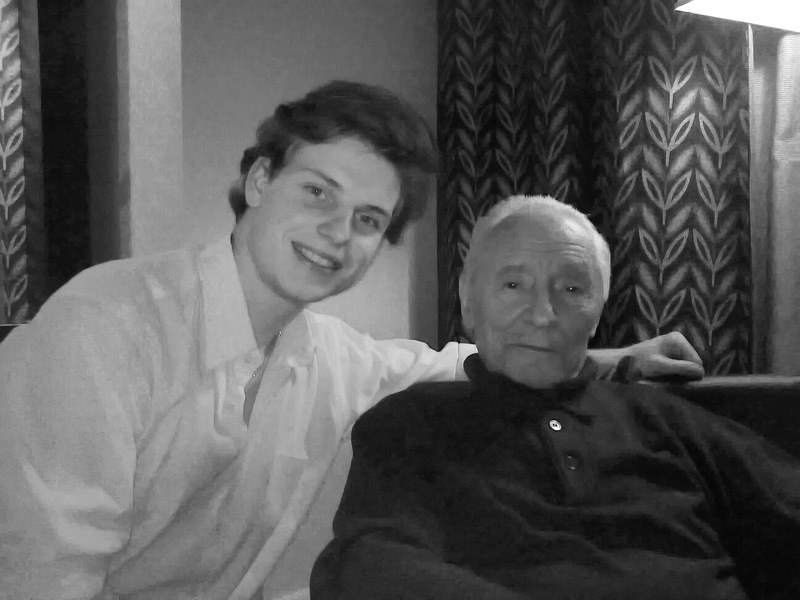 As Michal told me, you have to want to become better, set goals, not get comfortable. In practice, it can mean that you work more on your weak sides, or that you take class with guest teachers, or that you know which issues to focus on (as you cannot fix everything at once). It also helps to really like the work that you, as Michal does. In fact, he would love to dance even more. 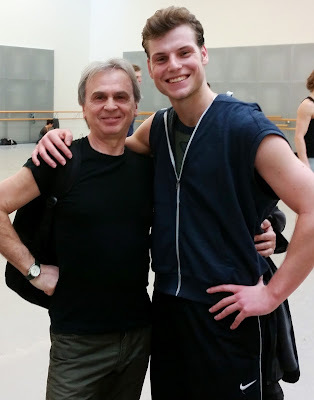 "With great teacher Sandor Nemethy", after company class at the Finnish National Ballet. Michal Krčmář is certified to teach ballet students until the age of 15 (following a specific curriculum). He never wanted to be a teacher, but when he observed friends practicing in the studio, he saw ways to help them with their dancing - so he decided to study and take the exam at his school. While his main job is to dance, he likes to coach young(er) dancers when the schedule allows for it, and also enjoys teaching on breaks. Every year, he goes back to Prague to teach classes at the State Conservatory. Most recently, he taught at the Fukuoka Ballet Festival in Japan (where he also performed). Not just kids, but students ranging from 12 to 40 years, including ballet teachers. I've also had the pleasure of taking Michal's class on a few occasions, and it was a lot of fun. Also hard work, but in a positive way. I liked that it was not just a technical class, but that we really got to dance, and even experience what it would be like to practice and perform as a corps de ballet. I asked Michal Krčmář about his dream partners, and being a perfect gentleman, he answered "all the girls at the Finnish National Ballet." So I asked what kind of qualities make someone a great partner. Obviously, they all have the technique to dance a pas de deux, but some partnerships are just more made-in-heaven than others. For Michal, it's especially rewarding to dance with someone "who is on the same wave length, where you can have a drink and a nice talk, and you have a good chemistry and connection.." As it is, dancers are not always paired according to chemistry, but to height. 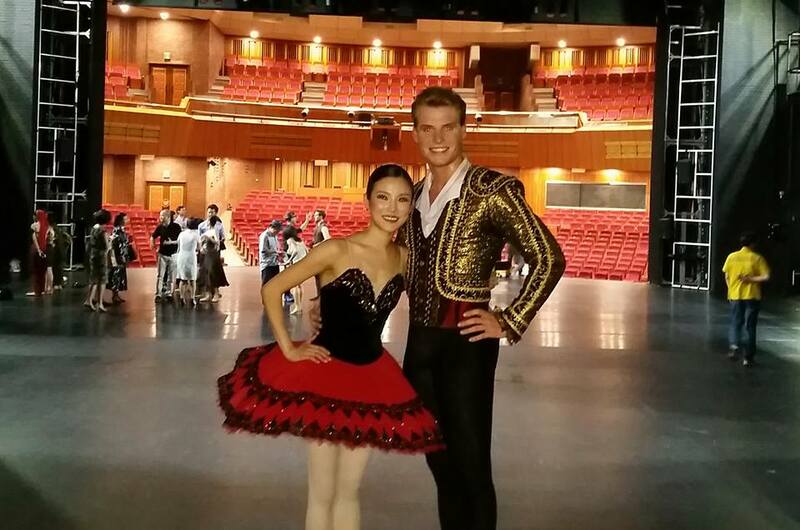 Michal with Eun-Ji Ha, after the show in Seoul, during the Festival of Korean World Ballet Stars. When Michal was dancing in Don Q, and his partner got injured shortly after the ballet had started, another principal (who just happened to be in the audience) was called on stage to save the show. Michal and Eun-Ji Ha had never danced together, and they had probably the shortest rehearsal in history, between Eun-Ji's quick change and make-up. But their impromptu pairing was magical, and a huge success with the audience. Still, it didn't result in a permanent or more regular pairing, as Michal tends to dance with the taller women, and Eun-Ji Ha with the less-taller men. They have, however, danced together at various charity/gala shows. And let's not forget about Svetlana Zakharova... When she guest-performed in FNB's production of La Bayadère (staged by Natalia Makarova), it was Michal who got to partner her. In my humble opinion, that is quite an honor for any dancer. 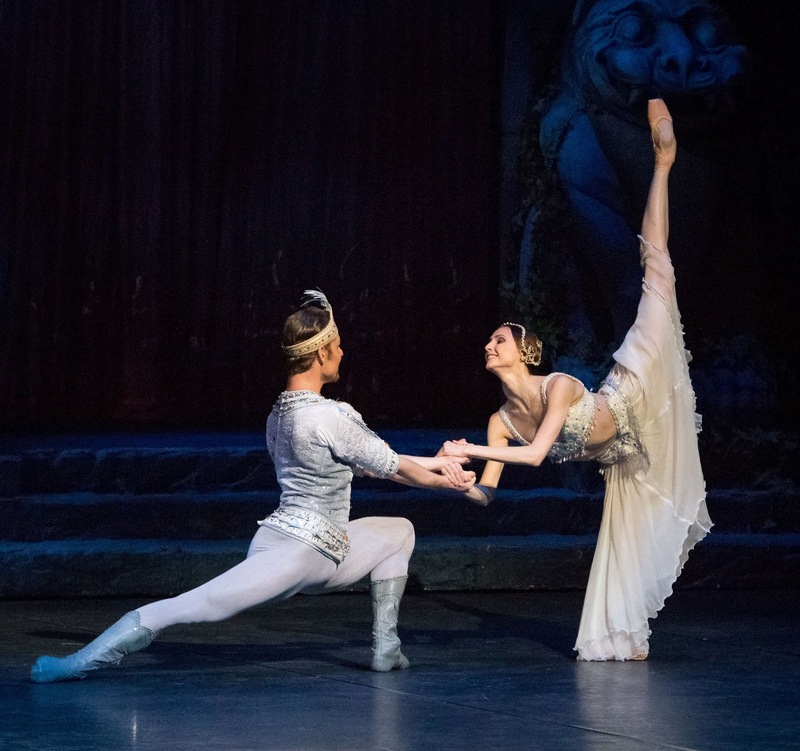 Svetlana Zakharova and Michal Krčmář, in La Bayadère. The Finnish National Ballet, January 2016. What does your typical day look like, from morning until night? I'll try to make it short: Waking up at 8:00 AM (without morning coffee I am useless). 10:00 - 11:15 morning class. A little break, then rehearsal for an hour and half. Lunch break for 45 minutes. Another one and half hour rehearsal. 15 minutes break, and another one and half hour rehearsal. Finishing work at 17:00. I usually stay longer for stretching or sauna, and sometimes I’m helping the young ones a bit. After work, some relaxing with friends, playing games or watching a movie. Nothing special. As a young boy, you practiced to become an ice-hockey player, but your mother introduced you to ballet lessons (at age… ). When did you decide to become a professional ballet dancer? I was 8 years old when I tried my first ballet lesson and it was quite interesting for me. There were some ballet-specific exercises which I did not like, but the acrobatic and musicality tests were actually really cool. You were promoted to Principal Dancer at the age of 22 (and nominated to rank of étoile in 2015), and have danced all the big classical roles… What is it that keeps pushing you forward? What do you dream of dancing/achieving in your future, career-wise? I was promoted to Principal dancer after last show of Don Quixote ( in 2011), when I danced Basilio. I think I was still 21... At that time, there were some injuries in the company which meant that I could show myself in many performances as Basilio. After 4 months in my new job, I started to get more "hungry"... Of course motivation is very important, but I think that in my case I am trying to find motivation in everything and work on myself in many ways. Simply to be a better dancer and person as well. I am trying to put my goals one by one in front of me and deal with them with patience and time. I was promoted to Étoile dancer last year in August (at the age of 25), after the first show of the season (Beauty and Beast), in front of a full auditorium and with my great colleagues on the stage beside me. Backstage, during Don Quixote. Photography (c) Sakari Viika. I remember during school years teachers were pushing us to work hard, but not so many of them were actually dancing leading roles almost every day... What I am trying to say: hard work is important, but it is not for stupid people. We as dancers must be very smart to achieve big roles and then to stay in condition to remain on top for many years. It requires smart way of thinking, taking good care of ourselves, "mental balance and peace" and PATIENCE!!! My big dream is to help people, dancers, and be an example. Be the kind of person people will remember as someone who did good things, and left something nice in this place (when I will be not here anymore). I never forget where I am coming from, who I am - and I never want to become selfish and snobbish. I want to stay as I am... Be there for people who need me. Are there any specific choreographers you hope to work with? Any specific ballets you would like to dance in? Armand Duval in Kameliendame by John Neumeier. Have you had any (funny) mishaps on stage? During my graduation show in 2009 we had quite a funny moment. After the classical part where I danced Frondozo from Laurencia we performed the contemporary part. Right in the middle of the number, a small dog came running on the stage. The dog had just ran away from the costume department straight onto the stage. It was very funny, the audience liked it and nobody was angry. After the show everybody was laughing. It was not even bad for the show, because the dog actually fitted in that piece.... haha. What has been your most challenging role/ballet so far? It is so hard to say... I am sorry, I don't know. Almost every production is challenging in a different kind of way (now I feel that I answered like some politician). Morning company class alone is not enough to stay in performing shape. How do you train outside of class? I love to do sports. Any sport and to keep moving somehow, is best for me and my body. The worst is when I stop and do nothing. Who are (some of) your favorite dancers, or colleagues that you look up to? Of course my biggest idol was and still is M. Baryshnikov. It will never change! Music!!! Mozart or Hans Zimmer. I am spending hours with them and many others as well. I cannot imagine my life without music. I used to say: Music is like the Sun and dance is like the Earth. Sun can be without Earth but Earth can't be without Sun. Same like music can exist without dance but dance without music is only movement. These two elements must be closely connected, then I love my job with all my heart. 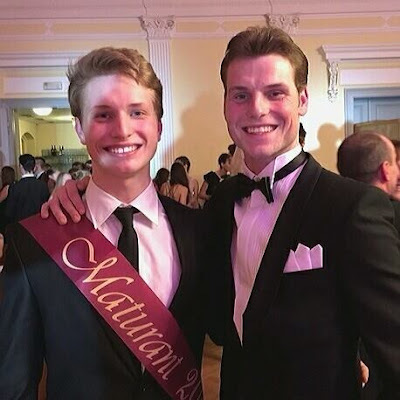 Your brother Martin is following in your footsteps, and has joined FNB’s Youth Company this season… Do you give him any advice, or corrections? With brother Martin, at his graduation ceremony. Yes I do, but there are much better people for helping him here and now in the Finnish National Ballet than me. If he will start to do some soloist roles in future, then I think I can help him more than now. How did you adjust to working at FNB, and living in Finland? (this question is from Eeva, a big fan of yours :). Living in Finland for me is basically 90% work and focusing on that. When I have free time I travel to explore, meet new people and get new contacts. You’ve talked about being a “smart dancer”, knowing when to push/pace yourself, and the importance about working outside your comfort zones. You’ve also taught kids, adults, and coached dancers from the Youth Company. As a dancer/teacher, what observations have you made? What kind of advice would you like to give adult ballet students? In the first place you have to love it. And then, you should not forget to have joy from working on yourself. In many cases dancers are practicing things which they are good at. For example, people who are flexible like to stretch, or people who have natural turns like to practice pirouettes. I learnt that practicing my weak sides is making me a very adaptable dancer - and the things I am good at are actually becoming easier because. That’s what I mean when I say it’s important to get out of your comfort zone. My biggest advice is to stay positive and be patient! Work smart and not always hard. We all have only one healthy body. In your career so far, who has/have been your most important influences? With teacher Jury Slypych, after his last show of Don Quixote (2012). Slypych danced the role of Espada, Michal danced Basilio. 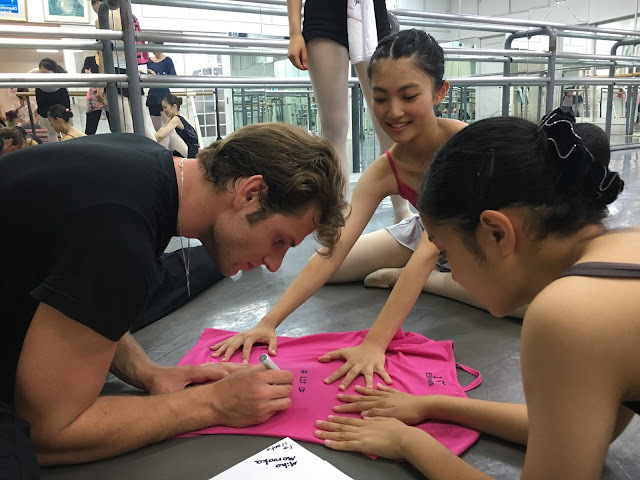 At FNB, you take company class with the Ballet Master and guest teachers… Do you have a trusted coach, someone you prepare roles with (when it’s not the choreographer)? Ingrid Nemeckova, our first ballet mistress. She is a fantastic coach, always caring and keeping me in shape. Thank god. Sometimes, if the Director Kenneth Greve is not busy I work with him. It is also very important for a male dancer to get some tricks from a much more experienced dancer. I am happy to have people like them in the company. What are your interests outside of ballet (in addition to your sports)? My big hobby is going out with friends. Organize events or parties. Video games and of course traveling. What advice would you like to give young(er) dancers? Keep trying, keep working, stay patient, stay healthy, never give up, don't let anyone push you down, help others, communicate, don't hesitate asking for help, don't forget to have a life, love and family. 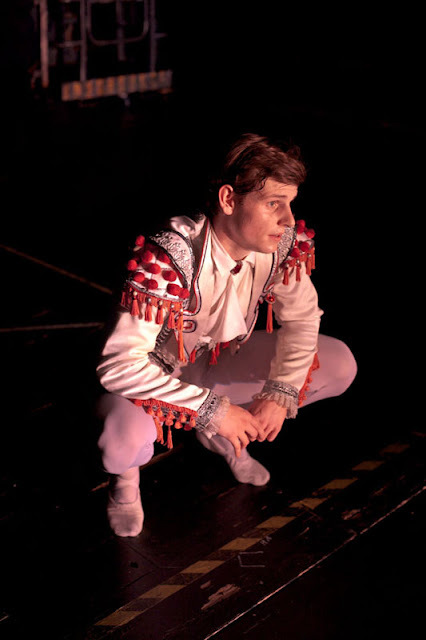 Michal can currently be seen on stage in Nataliá Horečná's new production of Romeo and Juliet (dancing the role of a "Spirit"). Between shows and classes, he is rehearsing for Jorma Elo's new ballet Alice in Wonderland (Liisa ihmemaassa), which will premiere in October 2016.